As you well aware that bearing is a device that supports, guides, and reduces the friction of motion between fixed and moving machine parts. All standard bearings have a characteristic basic designation it consist of basic numbers and supplementary symbols (Prefix and Suffix). 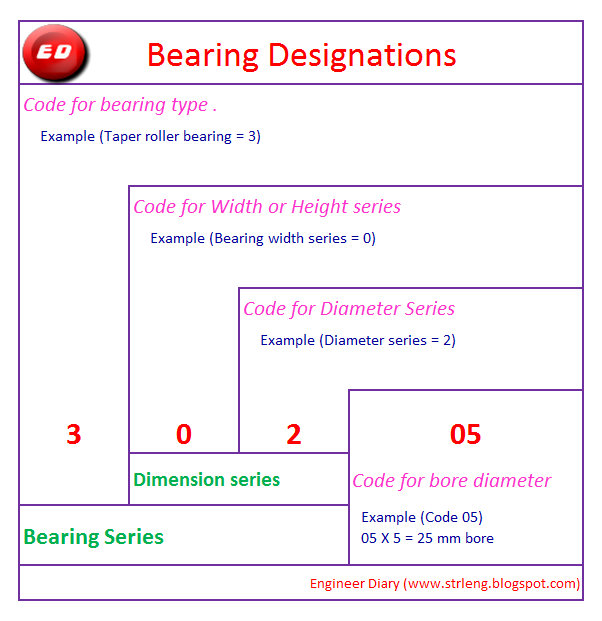 If you know the observation of bearing number you may proceed further without any delay of your activity / job. You know prefix and suffix details then it is an excellent. The first digit (or letter) designates the bearing type, the second and third digits indicate the dimension series to which the bearing belongs. The second digit represents the width (or height) series and the third digit the diameter series. The three first digits together designate the bearing series. The two last digits indicate the bore diameter. For bearing with bore diameter between 20 and 490 mm is obtained by multiplying the two last digits by five. For bearing with bore diameter greater than 490mm the bore diameter is directly indicated after an oblique (Ex.511 / 500). Special coding applies for bearings with bore diameter less than 20mm.